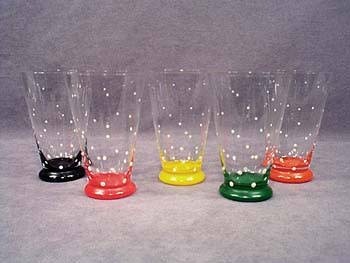 These five terrific 4-1/2" tall tapered glasses each have a different color base: red, black, green, orange, and yellow. All are decorated with textural white polka dots which resemble rising champagne bubbles. These glasses are made of thin crystal clear glass, that has a very delicate, comfortable feel. This spectacular set of glasses is in absolutely mint condition.